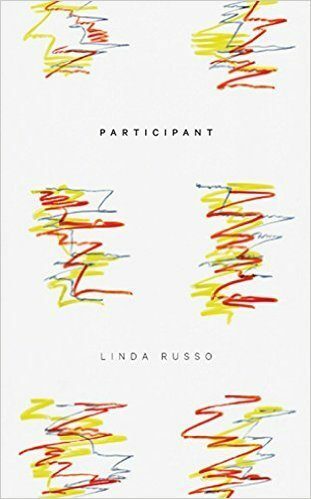 The relationship between poet and environment is, as Linda Russo says in her title poem “Participant,” “kind of Euclidean.” This Euclidean space—the space between a set of points that satisfies a certain relationship—makes up the wonderful drama of Russo’s book. Her work reads as a contemplative stroll, a responsive and interrelational experience with nature and the world. The 19th century dating of Webster’s dictionary represents her first engagement with the Euclidean space she is exploring. We are prompted to imagine a fourteen-year old Emily Dickinson in her Amherst home turning to Webster’s to look up the word. The frame exemplifies the relationship between Dickinson’s “wanderings” and Webster’s “peregrination.” Russo is interested in what she calls “inhabitory” poetics. The poetic mode is one entrenched in place as well as associations, carefully orchestrated in the space between Dickinson and Webster. “Weed Gathering,” the first poem, made up of just eight lines, elaborates on the epigraph, setting the tone for the rest of the work. Russo writes of the “she” in the poem, “She watched a more visible world in the folds.” The line is rich in its evocation of Dickinson’s “interspersed with weeds,” weeds being a product of “the folds” or the Euclidean point of between. This is the place that Russo wants to be and struggles to occupy in her work. “Inhabitory” poetry is that which want to achieve a “spatially-located way of knowing.” The poem ends with the line, “leaves like so many letters pulling closer,” encouraging us to see the distances within this line: between Dickinson and Russo, between language and the natural world, and between the real and the artificial. We are shown the “interspersed” as “leaf like letters,” what she will call back to in her last poetic sequence of the collection, “Leaflets,” as “sun/gleaming lightly/through leaves.” The light in the last line is the invisible becoming the “more visible world” which works to give a language to her poetry, the leaf-like letters coming together to form words. Rain stabbing points on a powerful map. Russo’s ecopoetical thinking is bound up in this hesitation, this fear of unleashing. The danger is that of responding. Russo fears if she takes too much in the response, this gesture would be not empowering, but over-empowering. The tension between agency and restraint is what drives the collection. We get a line profound in its pedestrianism; who among us hasn’t thought about life’s “grandness” as product of its temporality? But there is an “unhingedness” here, as if it means something more to Russo, that she must find the proper Euclidean connection with the world before her going. The participation in the world, by way of wandering, is a staccato act. Russo’s poet wanders, but does so almost compulsively, traversing spaces besides highways, hopping fences. She is constantly scanning look for her way into the pure place between herself and the spaces. Inhabitory poetics are tiring. The speaker of the poems is sometimes interrupted. “Three bees swoop across my face,” she writes. But she continues to look in the in-between spaces for the “unleashing” she seeks. As said early on, there is a danger in this act. She might find it and once having been found it might be too much. The playfulness and self-referentiality render the book humorous at times, and wholly refreshing. There is an admitted “mimicking” of the natural in this book. The poet eats a lunch taken at a “respectable distance” from the nearby trees. We see Russo’s speaker as unable to find the right entry point for the inhabitation she desires. Philip Rafferty is a teacher, poet, and critic living in Portland Oregon. His work has appeared in the publications: Typehouse, Cacti Fur, Blackheart Magazine, The Portland Book Review, and Montage, among others.